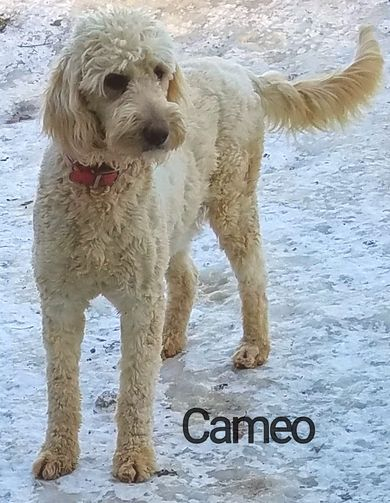 Cameo is a very sweet tempered F-1 Goldendoodle. She is a light apricot color. Her coat is thick, wavy and varies in shades throughout. She weighs about 65 lbs. She is always "on the ball"..... so intelligent! 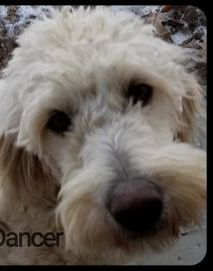 Dancer is a very jubilant and fun-loving F-1 Goldendoodle. She is cream/light apricot in color and has a thick, wavy coat with some loose curls when in a long coat. She is about 65 lbs. Dancer is very agile and well balanced. She is seen on two legs lots of times while playing! 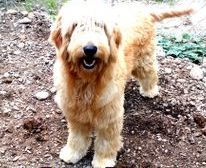 Scarlett is an Irish Goldendoodle with a beautiful mahoghany red color with Shirley Temple type loose curls when her coat is longer. She is a very docile intelligent gal who is a real joy to be around. She is a tall gal who weighs about 60 lbs. Pepper is a fun loving, curious gal who has a lush, very wavy black coat. Because of the reds and creams in her lines, she always surprises us with the color of her puppies. Pepper weighs about 65 lbs. 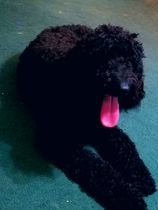 Pappy is a very handsome Standard Poodle male who absolutely loves attention! He is quite tall and weighs 68 lbs. He has a gorgeous true red color. He has a temperament to die for ~ always ready for a hug and a snuggle! Charlotte is a quiet girl with a lush apricot color. Charlotte is about 65 lbs. She is very gregarious and gets along with everyone! Super temperament. Charlotte was born here at Bittersweet Farm and her mom was pure black!! Happy is a Golden Retriever with a shiny, sleek dark red coat. She loves her stuffed animals and is usually seen carrying a toy in her mouth! She is a great mom and absolutely loves her puppies. 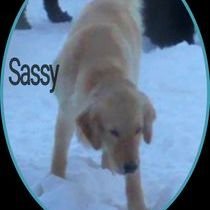 Sassafras is a beautiful champion bred Golden Retriever with a very soft creamy colored coat. She is extremely laid back and smart. She is very patient and gentle with everyone! She is small in size, weighing only 49 lbs.